A new feature in Oil Tycoon! v5.0 is to post your high scores to the Internet. High scores are measured by the amount of net worth you have at the end of the game. When you upload your high score to the Internet, the top scores and downloaded into your computer so you can see where you stand, and your score will be ranked in the list. However, your score will not be visible on the web site or to other people until a few days later. This is because we have to check the list of scores before it is updated. Note: Please refrain from using any expletives or other offensive language in the name you choose to post to the Internet. If you violate this rule, your score will be removed. 1. Rank: Your rank in the list of high scores. A line that is highlighted in blue indicates the score that you received during the current game. 2. Name: Name of the person who received the high score. 3. Date: Date the high score was achieved. 4. Score: The actual score achieved. 5. Current as of: Date the high scores were last updated. For local scores, this is always the current date. For Internet scores, it is the date they high score list was last updated. 6. Local Scores / Internet Scores: Selects which list of scores to view. If local scores is selected, the list contains the top scores on your computer. If Internet scores is selected, the list shows the top scores from the Internet, plus your new score if you have one. 7. Do not upload…: Select this box if you do not wish for your high scores to be uploaded to the Oil Tycoon! web site when you click Update High Scores. Instead, the top Internet scores will be downloaded to your computer. 8. Ranking: (only shown if you have a new high score) Gives your ranking on the current list with your new score. 9. Update Internet Scores: Click this button to update the top scores from the Internet onto your computer and, if you do not have "Do not upload…" checked, to upload your scores to the Internet. This process takes a few seconds while the game connects to oiltycoon.com and gets the scores. If you’re having difficulty, make sure you are connected to the Internet before you update the scores. 10. Exit Oil Tycoon: Click this button to leave Oil Tycoon! and return to Windows. 11. Restart Oil Tycoon! : Click this button to start a new game of Oil Tycoon! You can always find the high scores on the Oil Tycoon! website at http://www.oiltycoon.com. Just click the "High Scores" link on the right when you go to the page. 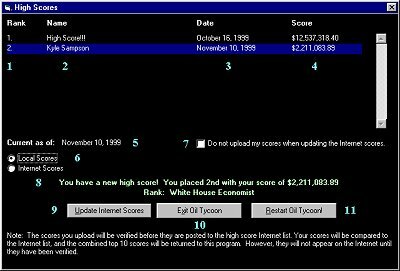 Before uploading your high scores, make sure you are connect to the Internet. Click the Update Internet Scores button to upload your high scores (make sure the "Do not upload…" box is cleared before doing so). After Oil Tycoon! has finished uploading the scores, the top scores will appear on your screen. Though your new score may be listed, it will not be uploaded onto the site until a short while later, after we update the scores. The scores are updated periodically, though not necessarily at regular intervals. Keep checking the site to see if your high score has been updated.